Engineers can apply for a no-charge, one-year license of MSC Apex® software in order to explore the power of MSC Apex for MSC-approved, non-commercial personal side projects. You must submit a 150-200 word description of the proposed side project(s) and why MSC Apex might be a good tool for the project(s). The number of projects/applications approved by MSC will be limited and is solely at MSC's discretion. MSC reserves the right, in its sole discretion, to accept or reject each application. MSC will notify accepted applicants within 14 days. Applicants not accepted may or may not receive a response from MSC. Application and participation in the MSC Apex Side Projects Program is subject to the Program Terms. Please review the Program Terms carefully. By submitting your online application or otherwise participating in the Apex Side Projects Program, you acknowledge that you have read and understand, and you agree to be bound by, the Program Terms. The Software may only be used for your non-commercial personal side-projects approved by MSC. Use of the Software for the benefit of your employer or other third parties, or for other commercial use, such as commercial consulting or other fee-generating activities is strictly prohibited. The Software may only be installed on your own personal computer (and not on third party computers, such as your employer's computer). If you are granted a license under this Program, from time to time, MSC may request feedback from you regarding your experience with the Software. MSC may freely use and disseminate any feedback provided by you. For any questions regarding applying for an MSC Apex Side Projects license under this Program, please contact ApexSideProjects@mscsoftware.com. Please note students are not eligible to apply for this Program. Engineering students are welcome to apply for the MSC Apex Student Edition. 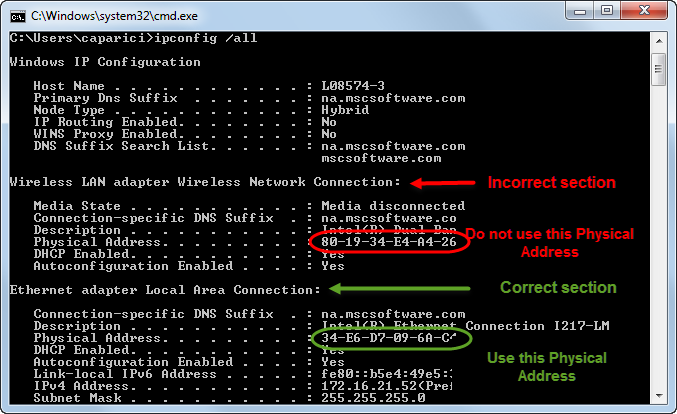 Search for section Ethernet adapter Local Area Connection. Are you a student? Please note: Students are not eligible for this Program.